At Fingal Driving School we pride ourselves on giving our customers our very best possible attention, whether you are a complete beginner, or you are preparing for your driving test. With over twenty years teaching experience, we can offer you excellent tuition in a warm and friendly atmosphere. Our prices are very competitive, and we can arrange lesson times to suit your needs. Apply for and pass a theory test. Learn to drive with FDS! Sit and pass the driving test. A short course of pre-test lessons with Fingal Driving School will hugely increase your chances of passing your driving test. By taking your first pre-test lesson well in advance of your test, you will give yourself plenty of time to increase your knowledge, develop new driving habits, and enhance your driving skills. Our mission is to get you driving and passing your test in the shortest possible time. 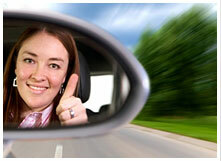 However, we believe in first-class driving instruction that goes well beyond simply teaching pupils to drive. At Fingal Driving School you will acquire a life-skill that you will be using years after you’ve passed your driving test. The EDT programme will apply to you if you have taken out your first learner permit after 4th April, 2011 (see EDT page). ©2011 Fingal Driving School. All rights reserved.